My thoughts on “alight”, the latest EP from sora tob sakana. You know, as I sat down to start writing this review it occurred to me that it sure seems like its been a long time since I’ve written about sora tob sakana for the site. So I went back into the archives and it turns out my last review was for their “cocoon ep” (review here) that came out last April. That’s so long ago that I was sure that I must have missed a new release from the group but upon consulting their website it turns out they just haven’t released anything new in the last 12 months. Something that sora tob sakana have done in the past 12 months is sign a major label record deal. The group has been picked up by Warner Brothers Japan in a move that came as somewhat of a surprise to me. I’m sure you all know that I take a bit of a dim view of the way most major labels handle Idol groups, but of course I bear no grudges against anyone for accepting an opportunity to make a better living for themselves. Often times things do have to be changed to appease your new investors however. 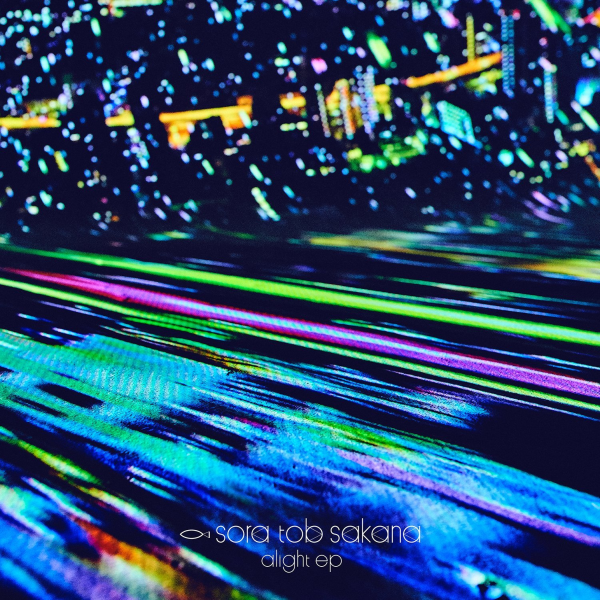 “alight ep” is sora tob sakana’s first release since signing that aforementioned major label deal. I am naturally curious as to how things are going to turn out now that there are more cooks in the kitchen. I’ve enjoyed their take on the Alternative Rock genre up to this point, even if it’s not something I find myself listening to on that regular of a basis. Hopefully sora tob sakana have held onto much of what got them to the dance in the first place but I suppose there’s only one way to find out. Let’s get into this review. The EP springs into life with opening track “Lightpool”. Now, it has been a little while so feel free to correct me if I’m wrong but wasn’t sora tob sakana’s thing that they drew fairly heavily from Alternative Rock influences? I’m not really detecting as much of that from the instrumental for this song, which instead appears to focus more on synthesizers and what I would call more of an Indie Rock sound. It’s very enjoyable don’t get me wrong, but it just wasn’t what I was expecting here. Vocally I’m somewhat in two minds about this one if I’m being honest. I quite like all of the girls’ voices and the chorus is decently catchy but there’s a few parts where the delivery doesn’t totally work for me. The bits where they punctuate every syllable of a word (it feels like that anyway) specifically. It’s a fairly minor gripe in the grand scheme of a song I did rather enjoy to be fair. “Eikakuna Nichijou” starts off with a percussion that would make you be forgiven for thinking that you’d accidentally hit play on a Maison book girl song instead. Unlike their IKEAcore counterparts however, sora tob sakana also opt to add some vaguely Alt Rock sounding guitars and drumming to the mix…along with the brass section of a Jazz ensemble. The instrumental on this song is something to behold folks, and perhaps even more amazing is the fact that it actually kinda works…if you’re into weird stuff like this. They even have clapping! Moving onto the vocal side of things and they do a pretty good job of matching the mood of the music, although some of the girls perhaps still sound a little bit too young to fully pull off what feels like a fairly mature sounding song. This one definitely isn’t for the fainthearted but I liked it quite a bit and it’s certainly one of the more creative songs I’ve heard in a while. We hit the halfway mark of the EP with “Himitsu”. Which I initially thought was going to sound even more like a Maison book girl song than the song that came just before it. The song quickly settles into sounding more like the sora tob sakana that I’m used to hearing, which was going pretty well until the song took another turn and ended up sounding like fairly vanilla Idol Pop-Rock. The song then cycles between these different styles until it reaches its conclusion. Perhaps unsurprisingly this song is all kinds of all over the place vocally. On the one hand I guess it’s cool that it shows off the group’s range but on the other it just feels really disjointed, much like the instrumental I suppose. It sorta feels like they had a bunch of ideas for a song and just tossed them in a pot and mixed them together on this one. It doesn’t help that the two prior songs were also much more interesting to the ear either. Not exactly the hardest act for the EP’s fourth song “Brand New Blue” to follow I must admit but given how odd a lot of the stuff has been so far all bets are off at this point. In the end this one turned out to be a fairly normal, kinda mid-tempo Pop-Rock offering that if I’m being totally honest feels a little bland by comparison to everything else that I’ve heard so far. Well, they did Jazz it up a bit (pun 100% intended) with a horn section so it certainly had that going for it at the very least. Lyrically however this one isn’t exactly going to be burrowing into your brain that easy, well not mine at least. Everything is pleasant sounding enough but nothing really stands out from the crowd with this one. The vocals sound good, they just don’t really capture the imagination which for the fourth track on an EP might be a pretty harsh take. Probably the weakest song I’ve heard from this release thus far. Just when I thought we might have had our prerequisite Ballad-style song for this release, along comes the penultimate track “Shinkirou no Kuni”. This one is actually kinda interesting though, which is probably not what you were expecting my to say here. I dunno, I’m somewhat intrigued by the “acoustic with a sprinkling of synthesizer” thing they’ve got going on for this track. Dare I say it but I’m reminded a little bit of Oyasumi Hologram with this one. Well, the instrumental does at least because I’m not sure sora tob sakana have the maturity or the life experiences that come with it to measure up to Hachigatsu and Kanamiru just yet. Still, that’s not the worst company to be mentioned in, especially since you guys know how big of an Oyasumi Hologram fan I am. Or perhaps I’m just starting to get soft in my old age, maybe that’s it. “Lighthouse” closes out the EP with what I initially thought was going to be some sort of live recording out on the street somewhere. Once again I was deceived however. Instead my ears were treated to some rather nice Piano-Rock…which would have likely sounded just as nice had it been recorded live in the street. You guys should know I have a thing for piano at this point so obviously I’m digging the instrumental on this one quite a bit. Throw in some fuzzy guitars and what more could I possibly ask for? Well, I suppose the vocals could have been a little bit lower pitched and less produced so there’s that. They work well enough with everything else though, despite them not really fully grabbing my attention. Should the instrumental be the more interesting part of a song? I don’t know, you guys tell me. Not a bad way to end things off though. Well, sora tob sakana certainly tried a lot of new and different things on this EP. Seems like signing to a major label hasn’t quite done them in like it has to other groups previously…not yet anyway. I kinda miss the Alternative Rock though, even if it was kinda lurking in the background of a few of the songs. Hopefully it makes a return on future releases. Speaking of future releases, sora tob sakana have already announced their follow-up to “alight ep”. It’s a single titled “New Stranger” and it comes out on July 25th so I guess we won’t have to wait long to hear what they’ve got planned for us next. Granted it does seem a bit soon for another CD but maybe they’re making up for the last 12 months of lost time.